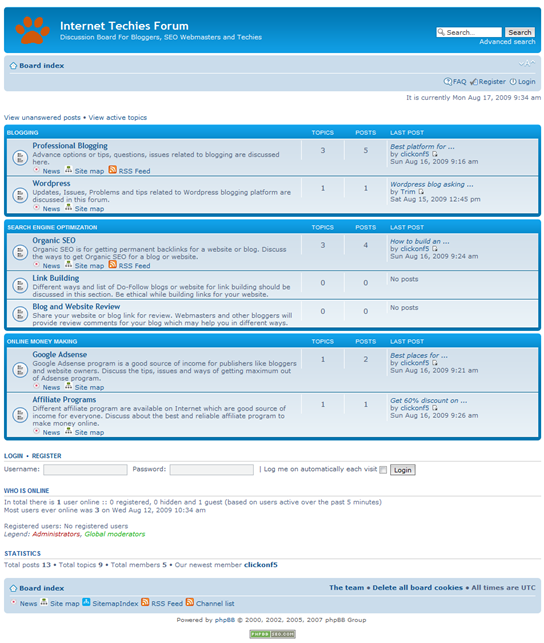 We are pleased to announce that Internet Techies Forum is now live for all of you. In last 6 – 7 months we received lot many questions related to Blogging, WordPress, SEO or Online Money Making sources thru Internet Techies comment section and we answered them too. Based on that we thought why not to go for a “Technology forum” where other experts and bloggers can also discuss issues, updates and promotional campaign over there. 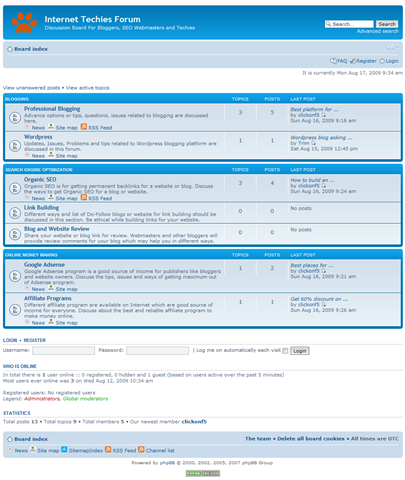 Internet Techies Forum is based on PHPBB3 platform with search engine friendly environment. Your questions and answers will be shown on Google and other search engines to provide you a good amount of exposure. I personally invite all of you to join Internet Techies Forum today to discuss different topics related to our and your niche. As I told you earlier in this post that we are receiving lot many questions related to blogging, WordPress problems, plug-in, Money Making and other areas then it will be better to invite other bloggers and webmasters or PHP experts to discuss the same and provide the best solution to users and viewers. Since it is forum, you will get all the default benefits of that on a single shot. We have enabled the “Signature” part on your profile thru which you can share a nice signature (including URL of your blog) to market that within your answers or questions. We are planning for “Most Active User” post on Internet Techies on monthly basis in which your name and URL will be mentioned. For this you will have to come up in the most active (Top 7) users on Internet Techies Forum. Initially we have started with below mentioned forum category, If you like to add something else then please let us know. We will collect those data and will try to add that category in Internet Techies Forum. We like to thank all of our readers and visitors for making “Internet Techies” a successful blog over this period. You will see this kind of initiatives in coming days as well. We need your help in creating and maintaining a reliable and useful community around Internet Techies.